Golvery Bluetooth V4.1 Receiver with EDR + A2DP profile offers a convenient and functional way to transform audio and hi-fi systems into wireless compatible ones. Pair two devices at once and listen to music with ease and freedom. This little device can be used on wired headphones, wired home sound system, car stereo, and other Non-Bluetooth devices. Already got your old bluetooth 3.0/2.0 receiver? Bluetooth 4.1 features clearer sound transmission, less music lag, etc. 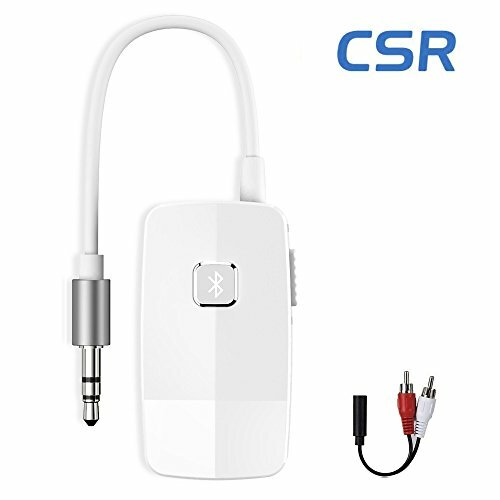 Plug the Bluetooth audio receiver into your car AUX port or home stereo sound system via 3.5 mm Jack or 2.5 mm RCA, Slide switch to power on and enter pairing mode to start the receiver and you are free to pair your smart device, then just go ahead to enjoy music,easy and simple. While charging, the item will be reset and power off.So if you want to use it, please re-turn on it while charging and the item will be automatically connected to your paired device. 1. The Bluetooth Adapter is not Bluetooth transmitter, not for TV/PC and can't pair and connect your Bluetooth Headphones/Speaker. 2. If you need bluetooth transmitter,please search Golvery Bluetooth Transmitter, they are on hot sales. Featured Bluetooth V4.1+EDR : Advanced CSR 4.1 chipset combining A2DP comes with stable connectivity and remarkable signal stability. Non-stop and clear HiFi music streaming creates enjoyable listening experience.Ideal to be used for your headphones,home sound system,car stereo and portable non-bluetooth device via the 3.5 mm or 2.5 mm RCA audio connector. Double Link and Extra-long Battery Life: Paired two Bluetooth devices( Such as two smartphone, Laptop or Tablet PC etc, not Bluetooth headphones or speakers) at once, with a range up to 33 feet in open space. Built-in battery provides up to 16 hours to play and talk, 400 hours to standby, only takes 2 hours to fully charge it. Easy to use: Plug the Bluetooth Receiver into your stereo speaker or car audio system and then slide switch to pair it with any your iPhone, iPod, iPad, Tablets, Other Smartphones or PC in seconds.Auto reconnected. Pure Sound: Get high quality audio sound with A2DP, allows you to enjoy HiFi stereo music without wire restriction. We believe in our products - That's why we back them all with an 12-month warranty and 30 days money back and provide friendly, easy-to-reach support. - Free Lifetime Technical Support.If you are searching 2-in-1 bluetooth transmitter & receiver,please find the ASIN: B01MR4WE7D or B01N4GK874 and they are on Hot Sale.